Buenos Aires - At least 500 water birds have died in a huge oil slick washing up on the beaches of Patagonia and threatening southern Argentinia's storehouse of biodiversity, media reports said Friday. The 15-square-kilometre slick was discovered Thursday in the Atlantic near the city Caleta Cordova in Chubut Province, and has covered at least four kilometres of beach, the reports said. The pending environmental disaster has triggered an investigation and prompted environmental volunteers to the rescue on the beach, where they have been shovelling up oil clumps. The central government in Buenos Aires has launched an emergency plan in cooperation with the Chubut government and ecology groups. Investigators plan to use satellite photos of various firms in the region to identify the culprit. 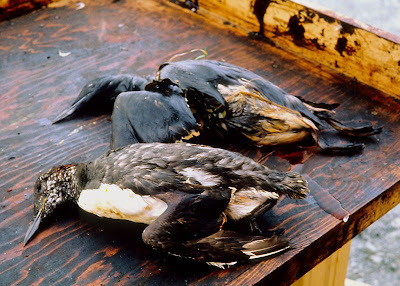 A smaller oil slick threatened the coast of Caleta Cordova in 2003.